Buffalo is the second largest city in the U.S. state of New York and the largest city in Western New York. As of 2017[update], the population was 258,612. The city is the county seat of Erie County and a major gateway for commerce and travel across the Canada–United States border, forming part of the bi-national Buffalo Niagara Region. 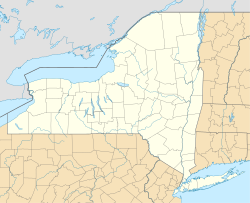 The Buffalo area was inhabited before the 17th century by the Native American Iroquois tribe and later by French settlers. The city grew significantly in the 19th and 20th centuries as a result of immigration, the construction of the Erie Canal and rail transportation, and its close proximity to Lake Erie. This growth provided an abundance of fresh water and an ample trade route to the Midwestern United States while grooming its economy for the grain, steel and automobile industries that dominated the city's economy in the 20th century. Since the city's economy relied heavily on manufacturing, deindustrialization in the latter half of the 20th century led to a steady decline in population. While some manufacturing activity remains, Buffalo's economy has transitioned to service industries with a greater emphasis on healthcare, research and higher education, which emerged following the Great Recession. Buffalo is on the eastern shore of Lake Erie, at the head of the Niagara River, 16 miles south of Niagara Falls. Its early embrace of electric power led to the nickname "The City of Light". The city is also famous for its urban planning and layout by Joseph Ellicott, an extensive system of parks designed by Frederick Law Olmsted, as well as significant architectural works. Its culture blends Northeastern and Midwestern traditions, with annual festivals including Taste of Buffalo and Allentown Art Festival, two professional sports teams (Buffalo Bills and Buffalo Sabres), and a music and arts scene. The city of Buffalo received its name from a nearby creek called Buffalo Creek. British military engineer Captain John Montresor made reference to "Buffalo Creek" in his 1764 journal, which may be the earliest recorded appearance of the name. There are several theories regarding how Buffalo Creek received its name. While it is possible its name originated from French fur traders and Native Americans calling the creek Beau Fleuve (French for "Beautiful River"), it is also possible Buffalo Creek was named after the American buffalo, whose historical range may have extended into western New York. An early map of the village of Buffalo and outer lots in 1854. Inset is Ellicott's 1804 plan. The first inhabitants of the State of New York are believed to have been nomadic Paleo-Indians, who migrated after the disappearance of Pleistocene glaciers during or before 7000 BCE. Around 1000 CE, 1,000 years ago, the Woodland period began, marked by the rise of the Iroquois Confederacy and its tribes throughout the state. During French exploration of the region in 1620, the region was occupied simultaneously by the agrarian Erie people, a tribe outside of the Five Nations of the Iroquois southwest of Buffalo Creek, and the Wenro people or Wenrohronon, an Iroquoian-speaking tribal offshoot of the large Neutral Nation who lived along the inland south shore of Lake Ontario and at the east end of Lake Erie and a bit of its northern shore. For trading, the Neutral people made a living by growing tobacco and hemp to trade with the Iroquois, utilizing animal paths or warpaths to travel and move goods across the state. These paths were later paved, and now function as major roads. Later, during the Beaver Wars of the 1640s-1650s, the combined warriors of the Five Nations of the Iroquois Confederacy conquered the populous Neutrals and their peninsular territory, while the Senecas alone took out the Wenro and their territory, c. 1651–1653. [a] Soon after, the Erie nation and territory was also destroyed by the Iroquois over their assistance to Huron people during the Beaver Wars. It was Louis Hennepin and Sieur de La Salle who made the earliest European discoveries of the upper Niagara and Ontario regions in the late 1600s. On August 7, 1679, La Salle launched a vessel, Le Griffon, that became the first full-sized ship to sail across the Great Lakes, eventually disappearing in Green Bay, Wisconsin. After the American Revolution, the colony of New York—now a state—began westward expansion, looking for habitable land by following trends of the Iroquois. Land near fresh water was of considerable importance. New York and Massachusetts were fighting for the territory Buffalo lies on, and Massachusetts had the right to purchase all but a one-mile (1600-meter) wide portion of land. The rights to the Massachusetts' territories were sold to Robert Morris in 1791, and two years later to the Holland Land Company. As a result of the war, in which the Iroquois tribe sided with the British Army, Iroquois territory was gradually whittled away in the mid-to-late-1700s by white settlers through successive treaties statewide, such as the Treaty of Fort Stanwix (1784), the First Treaty of Buffalo Creek (1788), and the Treaty of Geneseo (1797). The Iroquois were corralled onto reservations, including Buffalo Creek. By the end of the 18th century, only 338 square miles (216,000 acres; 880 km2; 88,000 ha) of reservation territory remained. Early settlers along the mouth of Buffalo Creek were former slave Joseph "Black Joe" Hodges, and Cornelius Winney, a Dutch trader from Albany who arrived in 1789. The first white settlers along the creek were prisoners captured during the Revolutionary War. The first resident and landowner of Buffalo with a permanent presence was Captain William Johnston, a white Iroquois interpreter who had been present in the area since the days after the Revolutionary War and was granted creekside land by the Senecas as a gift of appreciation. His house was built at present-day Washington and Seneca streets. On July 20, 1793, the Holland Land Purchase was completed, containing the land of present-day Buffalo, brokered by Dutch investors from Holland. The Treaty of Big Tree removed Iroquois title to lands west of the Genesee River in 1797. In the fall of 1797, Joseph Ellicott, the architect who helped survey Washington D.C. with brother Andrew, was appointed as the Chief of Survey for the Holland Land Company. Over the next year, he began surveying the tract of land at the mouth of Buffalo Creek. This was completed in 1803, and the new village boundaries extended from the creekside in the south to present-day Chippewa Street in the north and Carolina Street to the west, which is where most settlers remained for the first decade of the 19th century. Although the company named the settlement "New Amsterdam," the name did not catch on, reverting to Buffalo within ten years. Buffalo had the first road to Pennsylvania built in 1802 for migrants passing through to the Connecticut Western Reserve in Ohio. In 1804, Ellicott designed a radial grid plan that would branch out from the village forming bicycle-like spokes, interrupted by diagonals, similar to the system used in the nation's capital. In the middle of the village was the intersection of eight streets, in what would become Niagara Square. Several blocks to the southeast he designed a semicircle fronting Main Street with an elongated park green, formerly his estate. This would be known as Shelton Square, at that time the center of the city (which would be dramatically altered in the mid-20th century), with the intersecting streets bearing the names of Dutch Holland Land Company members,[b] today Erie, Church and Niagara streets. Lafayette Square also lies one block to the north, which was then bounded by streets bearing Iroquois names. According to an early resident, in 1806 there were sixteen residences, a schoolhouse and two stores in the village, primarily near Main, Swan and Seneca streets. There were also blacksmith shops, a tavern and a drugstore. The streets were small at 40 feet wide, and the village was still surrounded by woods. The first lot sold by the Holland Land Company was on September 11, 1806, to Zerah Phelps. By 1808, lots would sell from $25 to $50. Although slavery was rare in the state, limited instances of slavery had taken place in Buffalo during the early part of the 19th century. General Peter Buell Porter is said to have had five slaves during his time in Black Rock, and several news ads also advertised slaves for sale. In 1810, a courthouse was built. By 1811, the population was 500, with many people farming or doing manual labor. The first newspaper to be published was the Buffalo Gazette in October that same year. On 31 December, 1813, Buffalo and the village of Black Rock were burned by the British after the Battle of Buffalo. The battle and subsequent fire was in response to the unprovoked destruction of Niagara-on-the-Lake, then known as "Newark," by American forces. On 4 August, 1814, British forces under Lt. Colonel John Tucker and Lt. Colonel William Drummond, General Gordon Drummond's nephew, attempted to raid Black Rock and Buffalo as part of a diversion to force an early surrender at Fort Erie the next day, but were defeated by a small force of American riflemen under Major Lodwick Morgan at the Battle of Conjocta Creek, and withdrew back into Canada. Consequently, Fort Erie's siege under Gordon Drummond later failed, and British forces withdrew. Though only three buildings remained in the village, rebuilding was swift, finishing in 1815. Until April 2, 1821, the village of Buffalo was part of and the seat of Niagara County, until the legislature passed an act separating the two. On October 26, 1825, the Erie Canal was completed, formed from part of Buffalo Creek, with Buffalo a port-of-call for settlers heading westward. At the time, the population was about 2,400. By 1826, the 130 sq. mile Buffalo Creek Reservation at the western border of the village was transferred to Buffalo. The Erie Canal brought about a surge in population and commerce, which led Buffalo to incorporate as a city in 1832. The canal area was mature by 1847, with passenger and cargo ship activity leading to congestion in the harbor. The mid-1800s saw a boom in population, with the city doubling in size from 1845 to 1855. Almost two-thirds of the city's population were foreign-born immigrants in 1855, predominantly a mix of unskilled or educated Irish and Germans Catholics, who began self-segregating in different parts of the city. The Irish immigrants planted their roots along the railroad-heavy Buffalo River and Erie Canal to the southeast, to which there is still a heavy presence today; German immigrants found their way to the East Side, living a more laid-back, residential life. Some immigrants were apprehensive about the change of environment and elected to leave the city for the western region, while others tried to stay behind in the hopes of expanding their native cultures. Fugitive black slaves began making their way northward to Buffalo in the 1840s, and also settled on the city's East Side. In 1845, construction began on the Macedonia Baptist Church, a meeting spot in the Michigan and William Street neighborhood where blacks first settled. It also functioned as an important meeting place for the abolitionist movement. [better source needed] Buffalo was a terminus point of the Underground Railroad with many fugitive slaves crossing the Niagara River to Fort Erie, Ontario in search of freedom. During the 1840s, Buffalo's port continued to develop. Both passenger and commercial traffic expanded with some 93,000 passengers heading west from the port of Buffalo. [better source needed] Grain and commercial goods shipments led to repeated expansion of the harbor. In 1843, the world's first steam-powered grain elevator was constructed by local merchant Joseph Dart and engineer Robert Dunbar. "Dart's Elevator" enabled faster unloading of lake freighters along with the transshipment of grain in bulk from barges, canal boats, and rail cars. By 1850, the city's population was 81,000. In 1860, there were a plethora of railway companies and lines crossing through and terminating in Buffalo. Major ones were the Buffalo, Bradford and Pittsburgh Railroad (1859), Buffalo and Erie Railroad and the New York Central Railroad (1853). During this time, a quarter of all shipping traffic on Lake Erie was controlled by Buffalo citizens, and shipbuilding was a thriving industry for the city. Later, the Lehigh Valley Railroad would have its line terminate at Buffalo in 1867. At the dawn of the 20th century, local mills were among the first to benefit from hydroelectric power generated by the Niagara River. The city got the nickname City of Light at this time due to the widespread electric lighting. It was also part of the automobile revolution, hosting the brass era car builders Pierce Arrow and the Seven Little Buffaloes early in the century. At the same time, an exit of local entrepreneurs and industrial titans brought about a nascent stage that would see the city lose its competitiveness against Pittsburgh, Cleveland and Detroit. 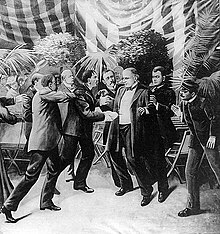 President William McKinley was shot and mortally wounded by an anarchist at the Pan-American Exposition in Buffalo on September 6, 1901. McKinley died in the city eight days later and Theodore Roosevelt was sworn in at the Wilcox Mansion. The Great Depression of 1929–39 saw severe unemployment, especially among working-class men. The New Deal relief programs operated full force. The city became a stronghold of labor unions and the Democratic Party. During World War II, Buffalo saw the return of prosperity and full employment due to its position as a manufacturing center. 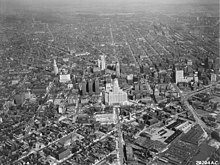 As one of the most populous cities of the 1950s, Buffalo's economy revolved almost entirely on its manufacturing base. Major companies such as Republic Steel and Lackawanna Steel employed tens of thousands of Buffalonians. Integrated national shipping routes would use the Soo Locks near Lake Superior and a vast network of railroads and yards that crossed the city. Lobbying by local businesses and interest groups against the St. Lawrence Seaway began in the 1920s, long before its construction in 1957, which cut the city off from valuable trade routes. Its approval was reinforced by legislation shortly before its construction. Shipbuilding in Buffalo, such as that of the American Ship Building Company, shut down in 1962, ending an industry that had been a sector of the city's economy since 1812, and a direct result of reduced waterfront activity. With deindustrialization, and the nationwide trend of suburbanization; the city's economy began to deteriorate. Like much of the Rust Belt, Buffalo, home to more than half a million people in the 1950s, has seen its population decline as heavy industries shut down and people left for the suburbs or other cities. Like other Rust Belt cities such as Pittsburgh and Cleveland, Buffalo has attempted to revitalize its beleaguered economy and crumbling infrastructure. The trend of back offices opening in the area began in the 1980s. 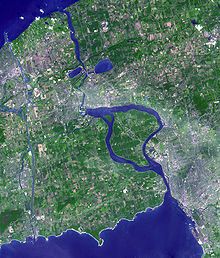 Buffalo is on Lake Erie's eastern end, opposite Fort Erie, Ontario, Canada. It is located at the origin of the Niagara River, which flows northward over Niagara Falls and into Lake Ontario. The city is 50 miles (80 km) south-southeast from Toronto. Relative to downtown, the city is generally flat with the exception of area surrounding North and High streets, where a hill of 90 feet gradually develops approaching from the south and north. In the Southtowns are the Boston Hills, while the Appalachian Mountains sit in the Southern Tier below them. To the north and east, the region maintains a flatter profile descending to Lake Ontario. Various types of shale, limestone and lagerstätten are prevalent in the geographic makeup of Buffalo and surrounding areas, which line the waterbeds within and bordering the city. Although there have not been any recent or significant earthquakes, Buffalo sits atop of the Southern Great Lakes Seismic Zone, which is part of the Great Lakes tectonic zone. Buffalo has four channels that flow through its boundaries: the Niagara River, Buffalo River and Creek, Scajaquada Creek, and the Black Rock Canal, which is adjacent to the Niagara River. 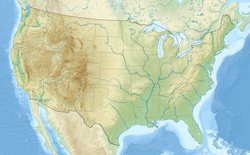 According to the United States Census Bureau, the city has an area of 52.5 square miles (136 km2), of which 40.6 square miles (105 km2) is land and the rest water. The total area is 22.66% water. Buffalo's architecture is diverse, with a collection of buildings from the 19th and 20th centuries. Most structures and works are still standing, such as the country's largest intact parks system designed by Frederick Law Olmsted and Calvert Vaux. At the end of the 19th century, the Guaranty Building—constructed by Louis Sullivan—was a prominent example of an early high-rise skyscraper. The 20th century saw works such as the Art Deco-style Buffalo City Hall and Buffalo Central Terminal, Electric Tower, the Richardson Olmsted Complex, and the Rand Building. Urban renewal from the 1950s–1970s gave way to the construction of the Brutalist-style Buffalo City Court Building and One Seneca Tower—formerly the HSBC Center, the city's tallest building. Buffalo has a humid continental climate (Köppen Dfb bordering on Dfa), which is common in the Great Lakes region. Buffalo has snowy winters, but it is rarely the snowiest city in New York state. The Blizzard of 1977 resulted from a combination of high winds and snow previously accumulated on land and on frozen Lake Erie. Snow does not typically impair the city's operation, but can cause significant damage during the autumn as with the October 2006 storm. In November 2014, the region had a record-breaking storm, producing over 5 1⁄2 feet (66 inches; 170 centimetres) of snow, this storm was named "Snowvember". Buffalo has the sunniest and driest summers of any major city in the Northeast, but still has enough rain to keep vegetation green and lush. Summers are marked by plentiful sunshine and moderate humidity and temperature. Obscured by the notoriety of Buffalo's winter snow is the fact Buffalo benefits from other lake effects such as the cooling southwest breezes off Lake Erie in summer that gently temper the warmest days. As a result, temperatures only rise above 90 °F (32.2 °C) three times in the average year, and the Buffalo station of the National Weather Service has never recorded an official temperature of 100 °F (37.8 °C) or more. Rainfall is moderate but typically occurs at night. Lake Erie's stabilizing effect continues to inhibit thunderstorms and enhance sunshine in the immediate Buffalo area through most of July. August usually has more showers and is hotter and more humid as the warmer lake loses its temperature-stabilizing influence. The highest recorded temperature in Buffalo was 99 °F (37 °C) on August 27, 1948 and the lowest recorded temperature was −20 °F (−29 °C), which occurred twice, on February 9, 1934 and February 2, 1961. Like most former industrial cities of the Great Lakes region in the United States, Buffalo is recovering from an economic depression from suburbanization and the loss of its industrial base. The city's population peaked in 1950 when it was the 15th largest city in the United States, and its population has been spreading out to the suburbs every census since then. At the 2010 Census, the city's population was 50.4% White (45.8% non-Hispanic White alone), 38.6% Black or African-American, 0.8% American Indian and Alaska Native, 3.2% Asian, 3.9% from some other race and 3.1% from two or more races. 10.5% of the total population was Hispanic or Latino of any race. Since 2003, there has been an ever-growing number of Burmese refugees, mostly of the Karen ethnicity, with an estimated 4,665 now residing in Buffalo. The median income for a household in the city is $24,536 and the median income for a family is $30,614. Males have a median income of $30,938 versus $23,982 for females. The per capita income for the city is $14,991. 26.6% of the population and 23% of families are below the poverty line. Out of the total population, 38.4% of those under the age of 18 and 14% of those 65 and older are living below the poverty line. Buffalo's economic sectors include industrial, light manufacturing, high technology and services. The State of New York, with over 15,000 employees, is the city's largest employer. Other major employers include the United States government, Kaleida Health, M&T Bank (which is headquartered in Buffalo), the University at Buffalo, General Motors, Time Warner Cable and Tops Friendly Markets. Buffalo is home to Rich Products, Canadian brewer Labatt, cheese company Sorrento Lactalis, Delaware North Companies and New Era Cap Company. More recently, the Tesla Gigafactory 2 opened in South Buffalo in summer 2017, as a result of the Buffalo Billion program. The loss of traditional jobs in manufacturing, rapid suburbanization and high labor costs have led to economic decline and made Buffalo one of the poorest U.S. cities with populations of more than 250,000 people. An estimated 28.7–29.9% of Buffalo residents live below the poverty line, behind either only Detroit, or only Detroit and Cleveland. Buffalo's median household income of $27,850 is third-lowest among large cities, behind only Miami and Cleveland; however the metropolitan area's median household income is $57,000. This, in part, has led to the Buffalo-Niagara Falls metropolitan area having the most affordable housing market in the U.S. The quarterly NAHB/Wells Fargo Housing Opportunity Index (HOI) noted nearly 90% of the new and existing homes sold in the metropolitan area during the second quarter were affordable to families making the area's median income of $57,000. As of 2014[update], the median home price in the city was $95,000. Buffalo's economy has begun to see significant improvements since the early 2010s. Money from New York State Governor Andrew Cuomo through a program known locally as "Buffalo Billion" has brought new construction, increased economic development, and hundreds of new jobs to the area. As of March 2015, Buffalo's unemployment rate was 5.9%, slightly above the national average of 5.5%. In 2016, the U.S. Bureau of Economic Analysis valued the Buffalo area's economy at $54.9 billion. Buffalo's crime rate is higher than the national average. In 2015, there were 41 murders, 1,033 robberies, and 1,640 assaults. In 2016, bizjournals.com published an article including an FBI report that ranked Buffalo's violent crime rate as the 15th-worst in the nation. Buffalo's cuisine encompasses a variety of cultural contributions, including Sicilian, Italian, Irish, Jewish, German, Polish, African-American, Greek and American influences. In 2015, the National Geographic Society ranked Buffalo third on their list of "The World's Top Ten Food Cities." Locally owned restaurants offer Chinese, German, Japanese, Korean, Vietnamese, Thai, Mexican, Sicilian, Italian, Arab, Indian, Myanmar, Caribbean, soul food and French cuisine. Buffalo's local pizzerias differ from the thin-crust New York-style pizzerias and deep-dish Chicago-style pizzerias and is locally known for being a midpoint between the two. The Beef on weck sandwich, kielbasa, sponge candy, pastry hearts, pierogi and haddock fish fries are local favorites, as is a loganberry-flavored beverage that remains relatively obscure outside of Western New York and Southern Ontario. Teressa Bellissimo first prepared the now widespread Chicken Wings at the Anchor Bar in October 1964. An all-vegan restaurant, Root & Bloom Cafe, opened in the Elmwood Village neighborhood in 2018. Buffalo has several well-known food companies. Non-dairy whipped topping was invented in Buffalo in 1945 by Robert E. Rich, Sr. His company, Rich Products, is one of the city's largest private employers. General Mills was organized in Buffalo and Gold Medal brand flour, Wheaties, Cheerios and other General Mills brand cereals are manufactured here. Archer Daniels Midland operates its largest flour mill in the city. Buffalo is home to one of the world's largest privately held food companies, Delaware North Companies, which operates concessions in sports arenas, stadiums, resorts and many state and federal parks. The Taste of Buffalo and National Buffalo Wing Festival showcase food from the Buffalo area. These are two of the many festivals that occur in Buffalo during the summer. Buffalo is home to over 50 private and public art galleries, most notably the Albright-Knox Art Gallery, home to a collection of modern and contemporary art, and the Burchfield-Penney Art Center. In 2012, AmericanStyle ranked Buffalo twenty-fifth in its list of top mid-sized cities for art. It is also home to many independent media and literary arts organizations like Squeaky Wheel Film and Media Arts Center. The Buffalo area's largest theater is Shea's Performing Arts Center, designed to accommodate 4,000 people with interiors by Louis Comfort Tiffany. Built in 1926, the theater presents Broadway musicals and concerts. The theater community in the Buffalo Theater District includes over 20 professional companies. The Allentown Art Festival showcases local and national artists every summer, in Buffalo's Allentown district. Buffalo is also home to the Freedom Wall, which is situated at the corner of Michigan Avenue and East Ferry Street. The Freedom Wall was commissioned by the Albright-Knox Art Gallery Public Art Initiative, with support from the Niagara Frontier Transportation Authority. 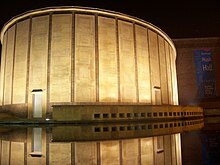 Kleinhans Music Hall is home to the Buffalo Philharmonic Orchestra. The Buffalo Philharmonic Orchestra, which performs at Kleinhans Music Hall, is one of the city's most prominent performing arts institutions. During the 1960s and 1970s, under the musical leadership of Lukas Foss and Michael Tilson Thomas, the Philharmonic collaborated with Grateful Dead and toured with the Boston Pops Orchestra. Buffalo has the roots of many jazz and classical musicians, and it is also the founding city for several mainstream bands and musicians, including Rick James, Billy Sheehan, The Quakes, and The Goo Goo Dolls. Vincent Gallo, a Buffalo-born filmmaker and musician, played in several local bands. Jazz fusion band Spyro Gyra and jazz saxophonists Grover Washington Jr. also got their starts in Buffalo. Pianist and composer Leonard Pennario was born in Buffalo in 1924 and made his debut concert at Carnegie Hall in 1943. Buffalo's "Colored Musicians Club", an extension of what was long ago a separate musicians' union local, is thriving today and maintains a significant jazz history within its walls. Well-known indie artist Ani DiFranco hails from Buffalo. Although the region's primary tourism destination is Niagara Falls to the north, Buffalo's tourism relies on historical attractions and outdoor recreation. The city's points of interest include the Edward M. Cotter fireboat, considered the world's oldest active fireboat and is a United States National Historic Landmark, Buffalo and Erie County Botanical Gardens, the Buffalo and Erie County Historical Society, Buffalo Museum of Science, the Buffalo Zoo—the third oldest in the United States— Forest Lawn Cemetery, Buffalo and Erie County Naval & Military Park, the Anchor Bar and Darwin D. Martin House. Redeveloped historical neighborhoods have also attracted tourism. The site of the former Erie Canal Harbor, Canalside has become a popular destination for tourists and residents since 2007 when Buffalo and the New York Power Authority began to redevelop the former site of the Buffalo Memorial Auditorium into historically accurate canals. Larkin Square, located in the former Hydraulics neighborhood and headquarters for the Larkin Company, has also become popular, featuring food trucks, concerts, and other events during the summer. Buffalo is one of the largest Polish-American centres in the United States. As a result, many aspects of Polish culture have found a home in the city from food to festivals. One of the best examples is the yearly celebration of Easter Monday, known to many Eastern Europeans as Dyngus Day. A cameraman shoots a game at New Era Field. Buffalo and the surrounding region is home to two major leagues professional sports teams. The NHL's Buffalo Sabres play in the city of Buffalo, while the NFL's Buffalo Bills play in suburban Orchard Park, New York, where they have been since 1973. The Bills, established in 1959, played in War Memorial Stadium until 1973, when Rich Stadium, now New Era Field, opened. The team competes in the AFC East division. Since the AFL–NFL merger in 1970, the Bills have won the AFC conference championship four consecutive times (1990, 1991, 1992, 1993), resulting in four lost Super Bowls (Super Bowl XXV, Super Bowl XXVI, Super Bowl XXVII and Super Bowl XXVIII); they were the only NFL team without a playoff appearance in the 21st century from 2011 until 2017, having missed the playoffs each season since 2000. KeyBank Center, located in Downtown Buffalo, has been home of the Sabres since 1996. The Sabres, established in 1970, played in Buffalo Memorial Auditorium until 1996, when Marine Midland Arena, now KeyBank Center opened. The team is within the Atlantic Division of the NHL. The team has won one Presidents' Trophy (2006-2007) and three conference championships (1974-1975, 1979-1980 and 1998-1999). However, like the Bills, the Sabres don't have a league championship, having lost the 1975 Stanley Cup to the Philadelphia Flyers and the 1999 Stanley Cup to the Dallas Stars. Since 2014, both the Bills and Sabres have been owned by Terrence Pegula, a key investor in Buffalo's revitalization efforts. The Buffalo Braves played at the National Basketball Association from 1970 to 1978, with their home games held at the Buffalo Memorial Auditorium. The team struggled financially, so it was relocated to California and became the San Diego Clippers. Buffalo is also home to several minor sports teams, including the Buffalo Bisons (baseball; an affiliate of the MLB's Toronto Blue Jays since 2014), FC Buffalo (soccer) as well as a professional women's team, the Buffalo Beauts (hockey). The Buffalo Bandits indoor lacrosse team was established in 1992 and played their home games in Buffalo Memorial Auditorium until 1996 when they followed the Sabres to Marine Midland Arena. They have won eight division championships and four league championships (1991-1992, 1992-1993, 1995-1996 and 2007-2008). The Buffalo Bulls are a Division I college team representing the State University of New York at Buffalo (which no longer is in the city proper); the only Division I college sports program within city limits is the Canisius Golden Griffins. * American Football League (AFL) championships were earned prior to the NFL merging with the AFL in 1970. † Date refers to current incarnation; Buffalo Bisons previously operated from the 1870s until 1970 and the current Bisons count this team as part of their history. The Buffalo parks system has over 20 parks with several parks accessible from any part of the city. The Olmsted Park and Parkway System is the hallmark of Buffalo's many green spaces. Three-fourths of city parkland is part of the system, which comprises six major parks, eight connecting parkways, nine circles and seven smaller spaces. Constructed in 1868 by Frederick Law Olmsted and his partner Calvert Vaux, the system was integrated into the city and marks the first attempt in America to lay out a coordinated system of public parks and parkways. The Olmsted-designed portions of the Buffalo park system are listed on the National Register of Historic Places and are maintained by the Buffalo Olmsted Parks Conservancy (BOPC), a non-profit, for public benefit corporation which serves as the city's parks department. It is the first non-governmental organization of its kind to serve in such a capacity in the United States. Situated at the confluence of Lake Erie and the Buffalo and Niagara rivers, Buffalo is a waterfront city. The city's rise to economic power came through its waterways in the form of transshipment, manufacturing, and an endless source of energy. Buffalo's waterfront remains, though to a lesser degree, a hub of commerce, trade and industry. Beginning in 2009, a significant portion of Buffalo's waterfront began to be transformed into a focal point for social and recreational activity. To this end, Buffalo Harbor State Park, nicknamed "Outer Harbor," was opened in 2014. Buffalo's intent was to stress its architectural and historical heritage to create a tourism destination, and early data indicates they were successful. At the municipal level, the City of Buffalo has a mayor and a council of nine councilmembers. Buffalo also serves as the seat of Erie County with some of the 11 members of county legislature representing at least a portion of Buffalo. At the state level, there are three states assemblymembers and two state senators representing parts of the city proper. At the federal level, Buffalo is the heart of New York's 26th congressional district in the House of Representatives, represented by Democrat Brian Higgins. In a trend common to northern "Rust Belt" regions, the Democratic Party has dominated Buffalo's political life for the last half-century. The last time anyone other than a Democrat held the position of Mayor in Buffalo was Chester A. Kowal in 1965. In 1977, Democratic Mayor James D. Griffin was elected as the nominee of two minor parties, the Conservative Party and the Right to Life Party, after he lost the Democratic primary for Mayor to then Deputy State Assembly Speaker Arthur Eve. Griffin switched political allegiances several times during his 16 years as Mayor, generally hewing to socially conservative platforms. Griffin's successor, Democrat Anthony M. Masiello (elected in 1993) continued to campaign on social conservatism, often crossing party lines in his endorsements and alliances. However, in 2005, Democrat Byron Brown was elected the city's first African-American mayor in a landslide (64%–27%) over Republican Kevin Helfer, who ran on a conservative platform. In 2013, the Conservative Party endorsed Brown for a third term because of his pledge to cut taxes. This change in local politics was preceded by a fiscal crisis in 2003 when years of economic decline, a diminishing tax-base and civic mismanagement left the city deep in debt and on the edge of bankruptcy. At New York State Comptroller Alan Hevesi's urging, the state took over the management of Buffalo's finances, appointing the Buffalo Fiscal Stability Authority, a New York State public-benefit corporation. Mayor Tony Masiello began conversations about merging the city with the larger Erie County government the following year, but they came to nought. The offices of the Buffalo District, US Army Corps of Engineers are next to the Black Rock Lock in the Erie Canal's Black Rock channel. In addition to maintaining and operating the lock, the District plans, designs, constructs and maintains water resources projects from Toledo, Ohio to Massena, New York. These include the flood-control dam at Mount Morris, New York, oversight of the lower Great Lakes (Lake Erie and Lake Ontario), review and permitting of wetlands construction, and remedial action for hazardous waste sites. Buffalo is also the home of a major office of the National Weather Service (NOAA), which serves all of western and much of central New York State. Buffalo is home to one of the 56 national FBI field offices. The field office covers all of Western New York and parts of the Southern Tier and Central New York. The field office operates several task forces in conjunction with local agencies to help combat issues such as gang violence, terrorism threats and health care fraud. Buffalo is also the location of the chief judge, United States Attorney and administrative offices for the United States District Court for the Western District of New York. Buffalo Public Schools serve most of the city of Buffalo. The city has 78 public schools, including a growing number of charter schools. As of 2006[update], the total enrollment was 41,089 students with a student-teacher ratio of 13.5 to 1. The graduation rate is up to 52% in 2008, up from 45% in 2007, and 50% in 2006. More than 27% of teachers have a master's degree or higher and the median amount of experience in the field is 15 years. The metropolitan area has 292 schools with 172,854 students. Buffalo's magnet school system attracts students with special interests, such as science, bilingual studies, and Native American studies. Specialized facilities include the Buffalo Elementary School of Technology; the Dr Martin Luther King Jr., Multicultural Institute; the International School; the Dr. Charles R. Drew Science Magnet; BUILD Academy; Leonardo da Vinci High School; PS 32 Bennett Park Montessori; the Buffalo Academy for Visual and Performing Arts, BAVPA; the Riverside Institute of Technology; Lafayette High School/Buffalo Academy of Finance; Hutchinson Central Technical High School; Burgard Vocational High School; South Park High School; and the Emerson School of Hospitality. The city is home to 47 private schools and the metropolitan region has 150 institutions. Most private schools, such as Bishop Timon – St. Jude High School, Canisius High School, Mount Mercy Academy, and Nardin Academy have a Catholic affiliation. In addition, there are two Islamic schools, Darul Uloom Al-Madania and Universal School of Buffalo. There are also nonsectarian options including The Buffalo Seminary (the only private, nonsectarian, all-girls school in Western New York state), Nichols School and numerous Charter Schools. Private school tuition is approximately 40% less than Buffalo Public School's per student spending. Private schools graduate nearly 100% of students, public schools only approximately 30%. The State University of New York (SUNY) operates three institutions within the city of Buffalo. The State University of New York at Buffalo is known as "Buffalo" or "UB" and is the largest public university in New York. The University at Buffalo is the only university in Buffalo and is a nationally ranked tier 1 research university. Buffalo State College and Erie Community College are a college and a community college, respectively. Additionally, the private institutions Canisius College and D'Youville College are within the city. The city is home to two private healthcare systems, which combined operate eight hospitals and countless clinics in the greater metropolitan area, as well as three public hospitals operated by Erie County and the State of New York. Oishei Children's Hospital opened in November 2017 and is the only long-standing children's hospital in New York. Buffalo General Medical Center and the Gates Vascular Institute have earned top rankings in the US for their cutting-edge research and treatment into the stroke and neurological care. Erie County Medical Center has been accredited as a Level One Trauma Center and serves as the trauma and burn care center for Western New York, much of the Southern Tier, and portions of Northwestern Pennsylvania and Ontario, Canada. Over the years, Roswell Park has also become recognized as one of the United States' leading cancer treatment and research centers, and it recruits physicians and researchers from across the world to come live and work in the Buffalo area. The 1955 Yellow Book planned the three major highways that would serve the Buffalo area: Interstate 190, Interstate 290, and Interstate 90. The Niagara Frontier Transportation Authority (NFTA) operates Buffalo Niagara International Airport, reconstructed in 1997 and located in the suburb of Cheektowaga. The airport serves Western New York and much of the Finger Lakes and Southern Tier Regions. The Buffalo Metro Rail, also operated by the NFTA, is a 6.4 miles (10.3 km) long, single line light rail system that extends from Erie Canal Harbor in downtown Buffalo to the University Heights district (specifically, the South Campus of University at Buffalo) in the city's northeastern part. The line's downtown section runs above ground and is free of charge to passengers. North of Fountain Plaza Station, at the northern end of downtown, the line moves underground until it reaches its northern terminus at University Heights. Passengers pay a fare to ride this section of the rail. Two train stations, Buffalo-Depew and Buffalo-Exchange Street, serve the city and are operated by Amtrak. Historically, the city was a major stop on through routes between Chicago and New York City through the lower Ontario peninsula. The Buffalo Outer Harbor in 1992. Northwest of the city is the Niagara River. Buffalo is at the Lake Erie's eastern end and serves as a playground for many personal yachts, sailboats, power boats and watercraft. The city's extensive breakwall system protects its inner and outer harbors, which are maintained at commercial navigation depths for Great Lakes freighters. A Lake Erie tributary that flows through south Buffalo is the Buffalo River and Buffalo Creek. Eight New York State highways, one three-digit Interstate Highway and one U.S. Highway traverse the city of Buffalo. New York State Route 5, commonly referred to as Main Street within the city, enters through Lackawanna as a limited-access highway and intersects with Interstate 190, a north-south highway connecting Interstate 90 in the southeastern suburb of Cheektowaga with Niagara Falls. NY 354 (Clinton Street) and NY 130 (Broadway) are east to west highways connecting south and downtown Buffalo to the eastern suburbs of West Seneca and Depew. NY 265 (Delaware Avenue) and NY 266 (Niagara Street and River Road) both start in downtown Buffalo and end in the city of Tonawanda. One of three U.S. highways in Erie County, the other two being U.S. 20 (Transit Road) and U.S. 219 (Southern Expressway), U.S. 62 (Bailey Avenue) is a north to south trunk road that enters the city through Lackawanna and exits at the Amherst town border at a junction with NY 5. Within the city, the route passes by light industrial developments and high-density areas of the city. Bailey Avenue has major intersections with Interstate 190 and the Kensington Expressway. Three major expressways serve Buffalo. The Scajaquada Expressway (NY 198) is primarily a limited access highway connecting Interstate 190 near Unity Island to New York State Route 33, which starts at the edge of downtown and the city's East Side, continues through heavily populated areas of the city, intersects with Interstate 90 in Cheektowaga and ends at the airport. The Peace Bridge is a major international crossing near the city's Black Rock district that connects Buffalo with Fort Erie and Toronto via the Queen Elizabeth Way. The city of Buffalo has a higher than average percentage of households without a car. In 2015, 30 percent of Buffalo households lacked a car, and decreased slightly to 28.2 percent in 2016. The national average was 8.7 percent in 2016. Buffalo averaged 1.03 cars per household in 2016, compared to a national average of 1.8. Buffalo's water system is operated by Veolia Water. To reduce large-scale ice blockage in the Niagara River—with resultant flooding, ice damage to docks and other waterfront structures, as well as blockage of the water intakes for the hydro-electric power plants at Niagara Falls—the New York Power Authority and Ontario Power Generation have jointly operated the Lake Erie-Niagara River Ice Boom since 1964. The boom is installed on December 16, or when the water temperature reaches 4 °C (39 °F), whichever happens first. The boom is opened on April 1 unless there is more than 650 square kilometres (250 sq mi) of ice remaining in Eastern Lake Erie. When in place, the boom stretches 2,680 metres (8,790 ft) from the outer breakwall at Buffalo Harbor almost to the Canadian shore near the ruins of the pier at Erie Beach in Fort Erie. The boom was originally made of wooden timbers, but these have been replaced by steel pontoons. Buffalo's major newspaper is The Buffalo News. Established in 1880 as the Buffalo Evening News, the newspaper has 181,540 in daily circulation and 266,123 on Sundays. With the radio stations WBEN (later WBEN-AM), WBEN-FM, and television station WBEN-TV, Buffalo's first and for several years only television station, the Buffalo Evening News dominated the local media market until 1977, when the newspaper and the stations were separated. The stations showed their affiliation with the newspaper in their call sign: WBEN. Other newspapers in the Buffalo area include Artvoice, The Public, and Buffalo Business First. According to Nielsen Media Research, the Buffalo television market is the 52nd largest in the United States as of 2013[update]. Movies shot with significant footage of Buffalo include: Hide in Plain Sight (1980), Tuck Everlasting (1981), Best Friends (1982), The Natural (1984), Vamping (1984), Canadian Bacon (1995), Buffalo '66 (1998), Manna from Heaven (2002), Bruce Almighty (2003), The Savages (2007), Henry's Crime (2011), Sharknado 2: The Second One (2014), Teenage Mutant Ninja Turtles: Out of The Shadows (2016), Marshall (2016), Accidental Switch (2016), and The American Side (2017). Although additional movies, such as Promised Land (2012), have used Buffalo as a setting, filming often takes place in other locations such as Pittsburgh or Canada. High production costs are blamed for filmmakers shooting all or most of their Buffalo-based scenes elsewhere. ^ Josephy, p. 189, [with the Neutrals]... " broken in 1651, with mopping up continuing for several years." ^ Formerly known as Stadtnitski, Vollenhoven and Schimmelpennick Avenues, removed after backlash by village residents. ^ When travelling with an ox and wagon team. ^ a b "Population and Housing Unit Estimates". Retrieved May 29, 2018. ^ Ketchum 1865, p. 63–65. ^ Severance, Frank H. (1902). "The Achievements of Captain John Montresor". In Buffalo Historical Society (ed.). Buffalo Historical Society Publications. Buffalo, NY: Bigelow Brothers. p. 15. Archived from the original on September 16, 2015. Retrieved August 14, 2015. ^ a b You asked us: The 868–3900 line to your desk at the Star: How Buffalo got its name, Toronto Star, Toronto, Ontario, Canada: Toronto Star, September 24, 1992, Stefaniuk, W., Retrieved April 23, 2014. ^ a b Worldly setting, sophisticated choices, atmosphere at Beau Fleuve, Buffalo News, Buffalo, NY: Berkshire Hathaway, March 19, 1993, Okun, J., Retrieved April 23, 2014. ^ a b 'Beau Fleuve' story doesn't wash, Buffalo News, Buffalo, NY: Berkshire Hathaway, July 21, 2003, Retrieved April 23, 2014. ^ Hornaday, William T. (1889). "Geographic Distribution". The Extermination of the American Bison. Washington D.C.: Government Printing Office. pp. 385–386. Archived from the original on September 24, 2015. Retrieved August 20, 2015. ^ Sprague 1882, pp. 17–18. ^ a b Thompson 1977, p. 113. ^ Thompson 1977, pp. 114–115, 117. ^ Bingham 1931, p. 1. ^ Thompson 1977, p. 118. ^ Thompson 1977, p. 117–118. ^ Bingham 1931, p. 5. ^ Houghton, Frederick (1927). "The Migrations of the Seneca Nation". American Anthropologist. 29 (2): 241–250. doi:10.1525/aa.1927.29.2.02a00050. ^ Donehoo, George P. (1922). "The Indians of the Past and of the Present". The Pennsylvania Magazine of History and Biography. The Pennsylvania Magazine of History and Biography. 46 (3): 177–198. JSTOR 20086480. ^ Thompson 1977, p. 119. ^ Becker 1906, pp. 15–20. ^ Turner 1849, p. 119–126. ^ Thompson 1977, p. 140. ^ Thompson 1977, p. 148. ^ Sprague 1882, p. 19. ^ Becker 1906, p. 108. ^ Thompson 1977, p. 141. ^ a b Brush 1901, p. 87. ^ Becker 1906, pp. 106–108. ^ Bingham 1931, pp. 137–138. ^ Sprague 1882, pp. 20, 21. ^ Becker 1906, p. 106–107. ^ Ketchum 1865, p. 141. ^ Bingham 1931, pp. 132–134. ^ Turner 1849, p. 401. ^ Bingham 1931, p. 145. ^ Bartlett, George Hunter (1922). Recalling Pioneer Days. The Buffalo Historical Society. p. 3. hdl:2027/wu.89065904492. ^ Stewart, John (1899). "Early Maps and Surveyors of the City of Washington, D. C.". Records of the Columbia Historical Society, Washington, D.C. 2: 48–71. JSTOR 40066723. ^ Bingham & 1931 146. ^ a b Becker 1906, p. 111. ^ a b Fernald, Frederik Atherton (1910). The index guide to Buffalo and Niagara Falls. The Library of Congress. Buffalo, N.Y., F.A. Fernald. p. 21. Archived from the original on March 26, 2017. Retrieved November 30, 2017. ^ Clinton, George W.; Hunt, Sanford B. (1862). Thomas' Buffalo City Directory for 1862, to which is Prefixed a Sketch of the Early History of Buffalo. Buffalo, NY: E.A. Thomas, Franklin Steam Printing House. p. 16. Archived from the original on September 25, 2015. Retrieved August 31, 2015. ^ French & Place 1860, p. 210. ^ Elmendorf, Dwight L. (March 1913). "Washington the Capital". The Mentor. 1: 2. ^ a b c Turner 1849, p. 439. ^ Powell, Elwin Humphreys (January 1, 1988). The Design of Discord: Studies of Anomie. Transaction Publishers. p. 59. ISBN 9781412836494. ^ Myers, Stephen G. (2012). Buffalo. Arcadia Publishing. p. 25. ISBN 9780738591650. ^ Myers, Stephen G. (2012). Buffalo. Arcadia Publishing. ISBN 9780738591650. ^ Buffalo Historical Society (1882). Semi-centennial Celebration of the City of Buffalo: Address of the Hon. E.C. Sprague Before the Buffalo Historical Society, July 3, 1882. Buffalo, N.Y.: Buffalo Historical Society. pp. 20, 21. ^ Turner 1849, p. 498. ^ Becker 1906, p. 114–115. ^ Becker 1906, pp. 111, 118. ^ Bingham 1931, p. 493. ^ a b Becker 1906, p. 115. ^ a b Thompson 1977, p. 152. ^ Turner 1849, p. 494. ^ Turner 1849, p. 495. ^ Bingham 1931, pp. 356–357. ^ Becker 1906, p. 115, 118. ^ Quimby, Robert (1997). The U.S. Army in the War of 1812: An Operational and Command Study. East Lansing, MI: Michigan State University Press. p. 355. ISBN 978-0-87013-441-8. ^ Gee, Denise Jewell (December 30, 2013). "200 years ago, the village of Buffalo burned". The Buffalo News. Archived from the original on February 27, 2017. Retrieved February 26, 2017. ^ "The Buffalo of Yesteryear: Chictawauga, Scajaquady and the 'morass' that was Buffalo". The Buffalo News. November 29, 2017. Archived from the original on November 29, 2017. Retrieved November 29, 2017. ^ Becker 1906, p. 125–126. ^ Severance, Frank H. (1879). "Papers relating to the Burning of Buffalo". Publications of the Buffalo Historical Society. Harold B. Lee Library. Buffalo : Bigelow Bros. pp. 334–356. ^ Becker 1906, p. 132. ^ Bingham 1931, p. 385. ^ "Erie Canal opens". The History Channel website. Archived from the original on October 14, 2014. Retrieved October 29, 2014. ^ Proceedings of the Common Council of the City of Buffalo. James D. Warren's Sons Co. 1909. p. 2262. ^ "Canal History". New York State Canals. New York State Canal Corporation. Archived from the original on March 7, 2016. Retrieved October 29, 2014. ^ Champieux, Robin (April 2003). "John W. Clark papers". William L. Clements Library. University of Michigan. Archived from the original on October 29, 2014. Retrieved October 29, 2014. ^ a b "A Brief Chronology of the Development of the City of Buffalo". National Park Service. Archived from the original on November 4, 2014. Retrieved October 29, 2014. ^ The Manufacturing Interests of the City of Buffalo: Including Sketches of the History of Buffalo. With Notices of Its Principal Manufacturing Establishments. C.F.S. Thomas. 1866. p. 13. ^ Goldman 1983, p. 72. ^ Goldman 1983, pp. 72–74. ^ Goldman 1983, pp. 75–76. ^ Goldman 1983, p. 87. ^ Savage, Beth L.; Shull, Carol D. (1994). African American Historic Places. Washington, D.C.: Preservation Press. pp. 346–347. ISBN 9780471143451. LCCN 94033218. OCLC 30976865. ^ Switala, William J. (May 14, 2014). Underground Railroad in New York and New Jersey. Stackpole Books. p. 126. ISBN 9780811746298. ^ Priebe Jr., J. Henry. "The City of Buffalo 1840–1850". Archived from the original on September 5, 2013. Retrieved September 9, 2007. ^ Baxter, Henry. "Grain Elevators" (PDF). Buffalo and Erie County Historical Society. Buffalo and Erie County Historical Society. Archived (PDF) from the original on October 13, 2014. Retrieved October 29, 2014. ^ Kowsky, Francis R. (2006). "Monuments of a Vanished Prosperity: Buffalo's Grain Elevators and the Rise and Fall of the Great Transnational System of Grain Transport" (PDF). In Schneekloth, Lynda H. (ed.). Reconsidering Concrete Atlantis: Buffalo Grain Elevators. The Urban Design Project, School of Architecture and Planning, University at Buffalo. pp. 24–25. Archived (PDF) from the original on September 27, 2016. Retrieved September 25, 2016. ^ French & Place 1860, pp. 66–74. ^ French & Place 1860, p. 286. ^ Believe it, or not. Clymer, Floyd. Treasury of Early American Automobiles, 1877–1925 (New York: Bonanza Books, 1950), p.178. ^ Dillaway 2006, p. 28–30. ^ "President William McKinley is shot". The History Channel website. Archived from the original on October 14, 2014. Retrieved November 2, 2014. ^ a b "Swearing-In Ceremony for President Theodore Roosevelt". Joint Congressional Committee on Inaugural Ceremonies. Archived from the original on November 1, 2014. Retrieved November 2, 2014. ^ "1941–1945". History. Parkside Community Association. Archived from the original on July 8, 2010. ^ Rizzo, Michael. "Joseph J. Kelly 1942–1945". Through The Mayor's Eyes. The Buffalonian. Archived from the original on September 26, 2011. ^ Goldman 1983, p. 270. ^ Goldman 1983, p. 271. ^ a b "Back in business". The Economist. The Economist Newspaper Limited. June 30, 2012. Archived from the original on October 30, 2014. Retrieved November 2, 2014. ^ a b Goldman 1983, pp. 270–271, 294. ^ "Population of the 100 Largest Urban Places: 1950". United States Census. June 15, 1998. Archived from the original on August 24, 2014. Retrieved November 2, 2014. ^ Koritz, Douglas (1991). "Restructuring or Destructuring?". Urban Affairs Quarterly. 26 (4): 497–511. doi:10.1177/004208169102600403. ^ The Editors of Encyclopædia Britannica (June 23, 2014). "Buffalo, New York". Encyclopædia Britannica. Encyclopædia Britannica, Inc. Archived from the original on February 2, 2017. Retrieved January 27, 2017. ^ Editors (May 17, 2010). "Encyclopaedia Britannica". www.britannica.com/place/Niagara-River. Encyclopaedia Britannica, INc. Archived from the original on February 2, 2017. Retrieved January 27, 2017. ^ Luther, D. D. (1906). Geologic map of the Buffalo quadrangle. Columbia University Libraries. New York State Education Dept. ^ "UB Geologists Find Evidence That Upstate New York Is Criss-Crossed By Hundreds Of Faults - University at Buffalo". www.buffalo.edu. Retrieved January 11, 2018. ^ Smith, Henry Perry (1884). History of the city of Buffalo and Erie County : with ... biographical sketches of some of its prominent men and pioneers ... Syracuse, N.Y.: D. Mason & Co. p. 16. ^ Ouroussoff, Nicolai (November 14, 2008). "Saving Buffalo's Untold Beauty". The New York Times. Archived from the original on October 6, 2014. Retrieved September 19, 2014. ^ "Buffalo, NY". Forbes. Forbes.com LLC. Archived from the original on October 7, 2014. Retrieved September 19, 2014. ^ Karson, Robin (January 21, 2014). The Best Planned City: Olmsted, Vaux, and the Buffalo Park System (Motion picture). Library of American Landscape History. ^ "Louis Sullivan still has a skyscraper in Buffalo, but Chicago has none". Archived from the original on September 25, 2015. Retrieved September 23, 2015. ^ E. Kaplan, Marilyn (June 1989). "Preservation Tech Notes: Guaranty Building" (PDF). National Park Service. Archived (PDF) from the original on January 13, 2016. Retrieved September 23, 2015. ^ Miller, Melinda (November 17, 2013). "Preparing for 38 floors of emptiness at One Seneca Tower". The Buffalo News. Archived from the original on September 26, 2015. Retrieved September 26, 2015. ^ Peel, M. C.; Finlayson B. L.; McMahon, T. A. (2007). "Updated world map of the Köppen–Geiger climate classification". Hydrol. Earth Syst. Sci. 11 (5): 1633–1644. doi:10.5194/hess-11-1633-2007. ISSN 1027-5606. ^ a b c d e f g "Buffalo's Climate". National Weather Service. Archived from the original on September 24, 2015. Retrieved August 19, 2015. ^ Madsen, Steve. "Comparison Golden Snowball City Stats 1940 – 2007". Goldensnowball. Archived from the original on February 8, 2014. , Retrieved May 31, 2013. ^ WeatherBug Meteorologists (January 3, 2012). "What Are The Snowiest Cities in the U.S.?". Weatherbug. Archived from the original on May 13, 2014. , Retrieved May 31, 2013. ^ "Buffalo remembers infamous blizzard of '77". USA Today. June 1, 2002. Retrieved September 19, 2015. ^ "Buffalo socked by wintry October surprise". WISTV. October 13, 2006. Archived from the original on October 6, 2014. Retrieved September 30, 2014. ^ "October Surprise Storm: 7th Anniversary". WGRZ. Gannett. Archived from the original on October 1, 2014. ^ McClam, Erin; Arkin, Daniel (20 November 2014). "Buffalo, Western New York Buried by Another Wave of Snow – NBC News". NBC News. Archived from the original on 30 September 2015. Retrieved 19 September 2015. ^ "Record high of 99 °F (37 °C) was recorded in August 1948". Weather.com. July 27, 2012. Archived from the original on December 7, 2013. ^ "August Daily Averages for Buffalo, NY". weather.com. Archived from the original on March 16, 2014. Retrieved December 6, 2011. ^ "February Daily Averages for Buffalo, NY". weather.com. Archived from the original on March 16, 2014. Retrieved December 6, 2011. ^ "NowData – NOAA Online Weather Data". National Oceanic and Atmospheric Administration. Retrieved September 7, 2016. ^ "Station Name: NY BUFFALO". National Oceanic and Atmospheric Administration. Retrieved September 7, 2016. ^ "WMO Climate Normals for Buffalo/Greater Buffalo, NY 1961–1990". National Oceanic and Atmospheric Administration. Retrieved December 10, 2013. ^ United States Census Bureau. "Census of Population and Housing". Archived from the original on April 22, 2013. Retrieved June 14, 2013. ^ "Annual Estimates of the Resident Population: April 1, 2010 to July 1, 2012". Archived from the original on June 2, 2013. Retrieved June 14, 2013. ^ "Buffalo (city), New York". United States Census Bureau. Archived from the original on May 4, 2014. ^ "Buffalo Demographics: 2010". quickfacts.census.go. Archived from the original on May 4, 2014. Retrieved November 8, 2011. ^ Zremski, Jerry; Gee, Derek (October 16, 2016). "From Burma to Buffalo, The refugee wave is changing our city". The Buffalo News. Archived from the original on October 21, 2016. Retrieved October 20, 2016. ^ Rott, Jerry (July 26, 2013). "List: Largest Employers". Buffalo Business First. American City Business Journals. Archived from the original on December 5, 2014. Retrieved September 19, 2014. ^ "Poverty USA – Catholic Campaign for Human Development – A hand up, not a hand out". Usccb.org. July 27, 2011. Archived from the original on July 10, 2011. ^ Buffalo 3rd Poorest Large City Archived January 5, 2013, at Archive.today. WGRZ TV. Retrieved October 14, 2008. ^ "Buffalo Market Trends". Trulia. Archived from the original on September 9, 2014. Retrieved September 19, 2014. ^ "Buffalo Economy News". City of Buffalo. Archived from the original on October 6, 2014. Retrieved October 5, 2014. ^ "Signs of economic revival finally appear". The Buffalo News. Archived from the original on October 6, 2014. Retrieved October 5, 2014. ^ New York State Department of Labor (April 21, 2015). "State Labor Department Releases Preliminary March 2015 Area Unemployment Rates". Labor.ny.gov. Archived from the original on March 31, 2015. Retrieved April 28, 2015. ^ National Conference of State Legislatures (April 3, 2015). "National Employment Monthly Update". Ncsl.org. Archived from the original on April 14, 2015. Retrieved April 28, 2015. ^ Thomas, G. Scott (February 16, 2016). "Which industries are driving the Buffalo area's economy? Here are the top 10". Buffalo Business First. Archived from the original on April 10, 2016. Retrieved February 16, 2016. ^ "Crime rate in Buffalo, New York (NY): murders, rapes, robberies, assaults, burglaries, thefts, auto thefts, arson, law enforcement employees, police officers, crime map". city-data.com. Archived from the original on August 4, 2017. Retrieved August 4, 2017. ^ Thomas, G. Scott. "New FBI report: Buffalo's violent-crime rate is 15th-worst in the nation". bizjournals. Archived from the original on August 4, 2017. Retrieved August 4, 2017. ^ "The World's Top Ten Food Cities". National Geographic. February 2015. Archived from the original on August 11, 2015. Retrieved July 30, 2015. ^ "Famous Buffalo and Western New York Foods, Restaurants & Food Festivals". Buffalo Chow.com. Archived from the original on September 7, 2013. Retrieved July 3, 2009. ^ "Top 100 Buffalo/WNY Foods (and Restaurants), Part 1 of 5". Buffalo Chow.com. February 10, 2009. Archived from the original on September 13, 2013. Retrieved July 3, 2009. ^ Addotta, Kip. "Pizza!". Kip Addotta dot com. Archived from the original on September 20, 2012. Retrieved July 3, 2009. ^ Horwitz, Jeremy (January 2008). "Loganberry: The Buffalo Drink You'll Like or Love". Buffalo Chow.com. Archived from the original on September 6, 2013. Retrieved July 3, 2009. ^ Trillin, Calvin. "The New Yorker". The New Yorker. Archived from the original on December 13, 2013. ^ "In the Land of Buffalo Wings, a Vegan-Only Meccah". ^ Shurtleff, William; Aoyagi, Akiko (2013). History of Non-Dairy Whip Topping, Coffee Creamer, Cottage Cheese, and Icing/Frosting (With and Without Soy) (1900–2013) (PDF). p. 6. ISBN 978-1-928914-62-4. Archived (PDF) from the original on December 21, 2016. ^ "Leading Businesses and Brands". Buffalo Niagara Enterprise. Archived from the original on September 28, 2014. Retrieved September 19, 2014. ^ World Grain Staff (May 13, 2013). "ADM to reopen flour mill after fire". World-Grain Report. Archived from the original on June 15, 2013. , Retrieved May 31, 2013. ^ "Who We Are – A Global Leader in Hospitality and Food Service". Delaware North Companies Homepage. Archived from the original on January 26, 2014. Retrieved July 3, 2009. ^ Algonquin Studios. "City of Buffalo Public Art Collection". City-buffalo.com. Archived from the original on June 3, 2013. ^ "Burchfield Penney Art Center". www.burchfieldpenney.org. Retrieved April 2, 2018. ^ Menzie, Karol. "Top 25 Mid-Size Cities for Art". AmericanStyle. Archived from the original on September 24, 2014. Retrieved September 19, 2014. ^ Healy, Patrick (December 23, 2011). "Shea's Performing Arts Center in Buffalo". The New York Times. ISSN 0362-4331. Archived from the original on October 13, 2015. Retrieved September 16, 2016. ^ Unofficial, Unbiased Guide to the 331 Most Interesting Colleges 2005. Simon and Schuster. 2004. ISBN 9780743251990. Archived from the original on July 5, 2014. Retrieved March 8, 2013. ^ Jim Volz (2007). The Back Stage Guide to Working in Regional Theater: Jobs for Actors. Random House. ISBN 9780823078806. Archived from the original on January 14, 2016. Retrieved March 8, 2013. ^ Mary Burzlaff Bostic (2010). 2011 Photographer's Market. Writer's Digest. ISBN 9781599632551. Archived from the original on July 5, 2014. Retrieved March 8, 2013. ^ https://www.albrightknox.org/community/ak-public-art/freedom-wall The Freedom Wall, 2017. ^ "History of the BPO". Buffalo Philharmonic Orchestra. Archived from the original on 10 August 2014. Retrieved 19 September 2014. ^ "E.M. Cotter". E.M. Cotter. Archived from the original on September 20, 2014. Retrieved September 19, 2014. ^ "The Buffalo & Erie County Historical Society Buffalo New York". Bechs.org. Archived from the original on October 27, 2013. ^ "Buffalo Museum of Science – Home". Sciencebuff.org. Archived from the original on April 24, 2014. ^ "Buffalo Zoo Mission Statement". Buffalo Zoo. Archived from the original on September 9, 2014. Retrieved September 19, 2014. ^ "About Canalside – Canalside Buffalo". www.canalsidebuffalo.com. Retrieved April 21, 2019. ^ "About Larkin Square – Larkin Square". Retrieved April 21, 2019. ^ "Dyngus Day America". Archived from the original on March 24, 2016. ^ Besecker, Aaron (August 18, 2016). "It's official: The Ralph will be called New Era Field". The Buffalo News. Archived from the original on August 23, 2016. Retrieved August 24, 2016. ^ "The Conservancy". Buffalo Olmsted Parks Conservancy. 2016. Archived from the original on October 13, 2016. Retrieved August 24, 2016. ^ Mark Sommer (August 27, 2014). "Buffalo's first state park to start taking shape on outer harbor". The Buffalo News. Archived from the original on September 5, 2015. Retrieved April 12, 2015. ^ "2015 Business Plan" (PDF). Visit Buffalo Niagara. 2015. Archived (PDF) from the original on September 10, 2016. Retrieved August 24, 2016. ^ "FBI Buffalo Division". Buffalo.fbi.gov. March 29, 2011. Archived from the original on March 10, 2011. ^ "SUNY Buffalo Regional Knowledge Network". Archived from the original on March 22, 2012. ^ "Buffalo Seminary". Buffalo Seminary. Archived from the original on April 24, 2014. ^ "Buffalo Public Schools Adult and Continuing Education Division". Archived from the original on October 31, 2013. ^ "CTE High School Programs". Buffaloschools.org. Archived from the original on June 13, 2010. Retrieved May 31, 2013. ^ "SUNY: Complete Campus List". Suny.edu. Retrieved November 23, 2011. ^ "SUNY Buffalo US News and World Report: National University Ranking". USnews. Archived from the original on April 21, 2016. Retrieved March 31, 2016. ^ "Oishei Children's Hospital". Oishei Children's Hospital. ^ Drury, George H. (1994). The Historical Guide to North American Railroads: Histories, Figures, and Features of more than 160 Railroads Abandoned or Merged since 1930. Waukesha, Wisconsin: Kalmbach Publishing. pp. 91, 229–231. ISBN 978-0-89024-072-4. ^ McLaren, Patrick; Singer, Jill (July 1, 2008). "Sediment Transport and Contaminant Behavior in the Buffalo River, New York: Implications for River Management". Journal of Coastal Research. 244: 954–968. doi:10.2112/06-0802.1. ISSN 0749-0208. ^ Ripa, Roger. "Peace Bridge Facts". www.peacebridge.com. Retrieved August 23, 2018. ^ Veolia Water (2012). "Treatment – Buffalo Water". Buffalowater.org. Archived from the original on February 6, 2015. Retrieved April 21, 2015. ^ The International Niagara Board of Control of the International Joint Commission (November 1999). "Lake Erie-Niagara River Ice Boom Information Sheet" (PDF). International Joint Commission. Archived (PDF) from the original on September 24, 2015. Retrieved April 21, 2015. ^ "Local Television Market Universe Estimates" (PDF). Nielsen. Nielsen Media Research. Retrieved March 31, 2015. ^ a b c d e f g h i j Simon, Jeff (April 17, 2011). "Buffalo's star turn". The Buffalo News. Archived from the original on September 27, 2016. Retrieved September 25, 2016. ^ a b c ""Marshall" isn't the first movie to be filmed in Buffalo". WKBW.com. May 23, 2016. Archived from the original on September 27, 2016. Retrieved September 25, 2016. ^ Belcher, Mark (April 15, 2016). "Buffalo to be taken over by Teenage Mutant Ninja Turtles for two weeks". WIVB.com. Archived from the original on February 20, 2016. Retrieved September 25, 2016. ^ Buckley, Eileen. "Locally-shot 'The American Side' to premiere in Buffalo". Archived from the original on September 23, 2017. Retrieved September 22, 2017. ^ Pignataro, T.J. (January 12, 2013). "Hopes for 'Draft Day' film may rest on financing". The Buffalo News. Archived from the original on September 27, 2016. Retrieved September 25, 2016. ^ a b c d e f g h i j k l m n o p q r s t "Interactive City Directory: Buffalo, New York". Washington DC, USA: Sister-cities International. Archived from the original on April 2, 2015. Retrieved March 14, 2015. , Retrieved May 31, 2013. ^ "Siena, Italy – City of Buffalo". City of Buffalo, New York. Archived from the original on September 28, 2011. Retrieved December 24, 2008. ^ "Buffalo-Kanazawa Sister City Committee". Japan in Buffalo.org. Archived from the original on July 22, 2015. ^ "Dortmund, Germany – City of Buffalo". City of Buffalo, New York. Archived from the original on September 28, 2011. Retrieved December 24, 2008. ^ "Serwis informacyjny UM Rzeszów – Informacja o współpracy Rzeszowa z miastami partnerskimi". www.rzeszow.pl. Archived from the original on April 19, 2014. Retrieved May 31, 2013. ^ "History". Buffalo-Rzeszow Sister Cities, Inc. Archived from the original on December 10, 2012. Retrieved December 24, 2008. ^ "Tver, Russia – City of Buffalo". City of Buffalo, New York. Archived from the original on September 28, 2011. Retrieved December 24, 2008. ^ "Buffalo and Drohobych join ranks of sister cities". The Ukrainian Weekly. April 1, 2001. Archived from the original on September 30, 2007. Retrieved December 24, 2008. ^ "Lille, France – City of Buffalo". City of Buffalo, New York. Archived from the original on September 28, 2011. Retrieved December 24, 2008. ^ Kearns, Michelle (March 16, 2013). "Sister cities, a banquet of international friendships". The Buffalo News. Archived from the original on June 18, 2013. , Retrieved May 31, 2013. ^ "Buffalo gains sister city: St. Ann, Jamaica". Buffalo News. September 19, 2007. Archived from the original on September 25, 2007. Retrieved December 24, 2008. ^ "Buffalo, N.Y. and Horlivka, Ukraine Foster Sister City Relationship". City of Buffalo, New York. May 25, 2007. Archived from the original on September 25, 2009. Retrieved December 24, 2008. Turner, Orsamus (1849). Pioneer history of the Holland Purchase of western New York. Buffalo, N.Y.: Jewett, Thomas & Co. OCLC 14246512. French, J. H.; Place, Frank (1860). Gazetteer of the State of New York. Syracuse, N.Y.: R. Pearsall Smith. OCLC 682410715. Ketchum, William (1865). "Origin of the Name of Buffalo". An Authentic and Comprehensive History of Buffalo, with Some Account of Its Early Inhabitants, Both Savage and Civilized, Comprising Historic Notices of the Six Nations, Or Iroquois Indians, Vol. II. Buffalo, N.Y.: Rockwell, Baker & Hill. ISBN 9780665514968. OCLC 49073883. Severance, Frank H. (1879). "Papers relating to the Burning of Buffalo". Publications of the Buffalo Historical Society. Harold B. Lee Library. Buffalo : Bigelow Bros.
Sprague, E. C. (1882). Semi-centennial Celebration of the City of Buffalo: Address of the Hon. E.C. Sprague Before the Buffalo Historical Society, July 3, 1882. Buffalo, N.Y.: Buffalo Historical Society. Builders' Association Exchange of Buffalo; National Association of Builders (1896). Queen of the lakes, Buffalo, the electric city of the future. Buffalo, N.Y.: The Courier Co. Printers. OCLC 17204632. Brush, Edward H. (1901). Iroquois Past and Present. Buffalo, N.Y.: Baker, Jones & Co.
Becker, Sophie C. (1906). Sketches of early Buffalo and the Niagara region. Buffalo, N.Y.: McLaughlin Press. OCLC 12629461. Bingham, Robert W. (1931). The cradle of the Queen city : a history of Buffalo to the incorporation of the city. Buffalo, N.Y.: Buffalo Historical Society. OCLC 364308016. Thompson, John H. (1977). Geography of New York State. Syracuse, N.Y.: Syracuse University Press. ISBN 9780815621829. LCCN 77004337. OCLC 2874807. Goldman, Mark (1983). High hopes: the rise and decline of Buffalo, New York. Albany, N.Y.: State University of New York Press. ISBN 9780873957342. OCLC 09110713. Dillaway, Diana (2006). Power failure: politics, patronage, and the economic future of Buffalo, New York. Amherst, N.Y.: Prometheus Books. ISBN 978-1591024002. Goldman, Mark (2007). City on the edge: Buffalo, New York. Amherst, N.Y.: Prometheus Books. ISBN 9781591024576. OCLC 74648927. Kowsky, Francis R. (1985). Buffalo Architecture: a guide. Cambridge, M.A. : MIT Press. ISBN 9780262520638. OCLC 637993088. Bohen, Timothy (2012). Against the Grain: The History of Buffalo's First Ward. Buffalo, N.Y.: Petit Printing. ISBN 9780615620527. OCLC 815395883. Williams, Lillian Serence (1999). Strangers in the land of paradise : the creation of an African American community, Buffalo, New York, 1900-1940. Indiana University Press. ISBN 9780253335524. Leary, Thomas E; Sholes, Elizabeth C (1997). Buffalo's waterfront. Charleston, SC: Arcadia. ISBN 978-0752408293. OCLC 38087547. Myers, Stephen G (2012). Buffalo. ISBN 9780738591650. OCLC 835592368. Kraus, Neil (2000). Race, neighborhoods, and community power: Buffalo politics, 1934-1997. Albany: State University of New York Press. ISBN 978-0791447437. OCLC 43296770.